This prune fruit pudding made with the fruit compote is so delicious. What makes this pudding so special is being topped with the vegan custard. Also, what I really like about it is that there is no sugar added. 1. Cut the prunes in half. 2. Cover prunes, cherries and raisins with water. 3. Soak the dried fruit for 12 – 24 hours. 4. In a separate bowl, cover the almonds with water. 5. Soak the almonds overnight. 6. Then, drain the water off the almonds. 7. Mix almonds in with dried fruit mixture. 8. Make the “Custard”(recipe is below) and pour on top of fruit and almonds. 9. Leave it to cool a little and serve warm or cold. 1. Mix arrowroot powder or Kuza and milk in a saucepan. 2. Bring to a boil, stirring constantly till thick. It is important to stir as it can go lumpy. 4. Remove the custard from the heat and serve as a topping or you can mix it into the fruit compote. 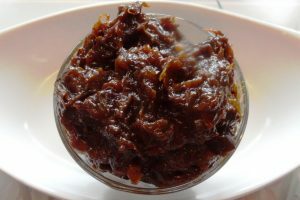 Yummy Prune Jam is Sugar-Free with Apples and Cinnamon – This prune jam was so easy to make. Adding the cinnamon made it extra delicious. I did add a little stevia to make it taste more like a jam. This recipe makes two small jars. Easy to Make Yummy Millet Pecan Pudding! Easy to Make Yummy Millet Pecan Pudding (Vegan and Sugar-free) – Once you have cooked the millet, this Millet Pecan Pudding is very simple to make. It is for sure tasty and so healthy without sugar so you can have it for breakfast. And it has no milk which makes it a great vegan dessert. Sweet Vegan Papaya Pudding – This yummy papaya pudding is very easy to make for dessert. Also, it is super nutritious with no added sugar.